The electrical contractors that residents of Southborough, Massachusetts, have relied on for comprehensive installations, repairs, and troubleshooting since 2008 are at VMA Electric. We’re a full-service electrical and audio/visual contractor with a great deal of experience with custom installation projects. On every job we do, our priority is ensuring that our customers receive the level of service they deserve. 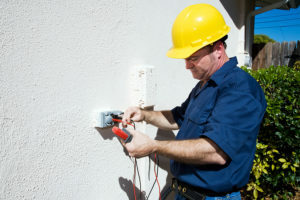 We employ electricians who are highly trained and average more than a decade of experience in the field. We often send an apprentice to provide an extra set of eyes and hands for our electricians on service calls. Our electrical contractors stay current on industry technologies and best practices so we can provide unmatched service. Our owner, Victor Archila, is personally involved in every project we do to ensure that our work meets the highest standards. And, because it’s impossible to predict when you might need service for an overheating circuit panel or sparking wire, VMA Electric has an electrician on call 24 hours a day, seven days a week. That way, you’ll always have someone ready to help if an electrical emergency occurs. If you would like to learn more about our dependable team of electrical contractors and the full range of services we provide for homeowners in the Southborough, MA, area, contact VMA Electric today.